Phillies manager Gabe Kapler talks with bench coach Rob Thomson during batting practice before the Phillies play the New York Yankees in a spring training game at George M. Steinbrenner Field in Tampa on Thursday, March 8, 2018. 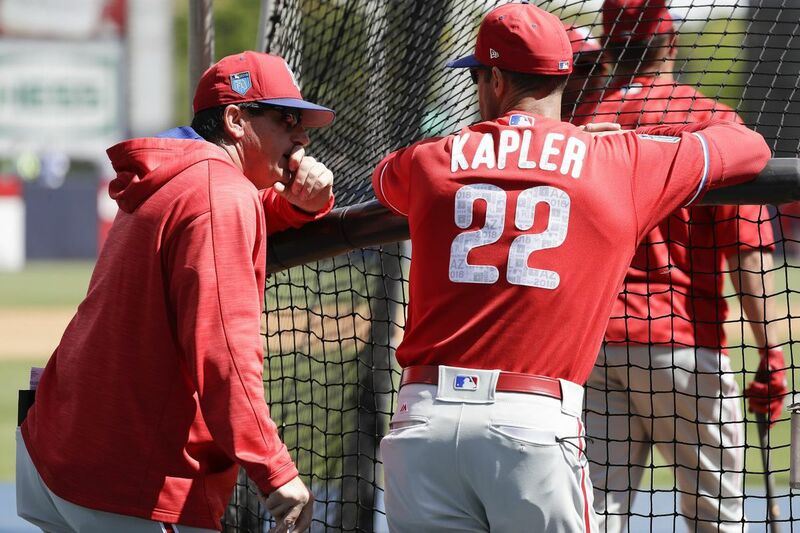 CLEARWATER, Fla. — Gabe Kapler sat Friday afternoon behind the protective netting just past the Phillies' on-deck circle. To his left — during all nine innings of a loss to Pittsburgh – was Rob Thomson, the baseball lifer who will serve as Kapler's guide as he navigates his first season as manager. Kapler is different, perhaps very different, from any manager in Phillies history. He delves into sabermetrics and researches exit velocities and launch angles. Kapler studies historical figures like the Rev. Martin Luther King Jr. and strives to be a great communicator. He is not your typical baseball manager. He had just one year of coaching experience — a season managing A ball in 2007 — before the Phillies hired him. Pairing Kapler with an experienced bench coach was an essential task when the Phillies assembled their coaching staff. And Thomson — the personification of "baseball man" — appears to be the perfect fit. "He's open-minded and I'm open-minded," Kapler said. "He hears me out and he might think that an idea makes sense, but he's always accepting. I think that's the word that I'd use to describe him: He's really accepting." Thomson played four minor-league seasons without graduating past A ball before retiring in 1988. He moved into coaching and spent 28 years with baseball royalty, working for the Yankees as a coach and manager and in the front office. Thomson, 54, was a bench coach under Joe Girardi and was the third-base coach for the 2009 world champions. Phillies bench coach Rob Thomson hits the baseball during fielding drills before the Phillies play the New York Yankees in a spring training game at George M. Steinbrenner Field in Tampa on Thursday, March 8, 2018. Thomson's wisdom — accrued over a four-decade journey — has already been a benefit to Kapler, 42. Thomson, Kapler said, pushes him at the right times. From behind that net, they discuss the game and debate strategy and nuance. "I was really surprised at how far ahead he was with his intelligence about managing a game," Thomson said. "It's difficult when you haven't done it before. I was really surprised and happy with how smart he is and how engaged he is." The two first met last fall as the Phillies were assembling their coaching staff. Thomson was let go by the Yankees after Girardi was fired. The fact that he was available, Kapler said, was a cause for celebration. Kapler prides himself on his preparedness and he met a man who was just as prepared. It has been Thomson's task to plan spring training, determining each day which drills the Phillies will run through. He is the first person to arrive at the ballpark, pulling into Spectrum Field before dawn. His work ethic, Kapler said, "is off the charts." Thomson left that first meeting and knew almost right away that Kapler had the skills to be a communicator. He worked for Girardi and with Joe Torre. He knows what makes a manager successful. And communication, he said, is crucial. Kapler has made it his mission, ever since being hired, to be a manager who communicates with his players. Kapler talked in the winter with almost every player on the roster, from text messages to dinners in their hometown. He carries an iPhone in his uniform pocket to capture photos and videos of players doing things he thinks they'll be inspired to see again. His office — located just off the clubhouse — was redesigned this winter to include a couch, inviting players to stop and chat. Rob Thomson during his time as the New York Yankees’ acting manager in 2017. "There's a whole lot of people that know X's and O's, but they don't know how to communicate," Thomson said. "They don't know how to take care of players. They don't know how to make sure that the players know that the manager has their back at all times. He can do that." Kapler and Thomson sat behind that net Friday as Chris Young, formerly an advance scout and now an assistant pitching coach, used advanced information to position outfielders. They sat there earlier this spring training as an analyst from the team's research and development department wore a uniform in the dugout. They were there when corner outfielders switched positions in the middle of an inning as the Phillies looked for an edge. They have been joined at times by Pedro Guerrero, a 29-year-old assistant hitting coach believed to be the youngest coach in the majors. Kapler has been different. And he is doing it with a baseball man by his side. "We'll find out if that's the right thing to do," Thomson said. "But the thing about that is that he's not afraid to try. If that helps, how does it help, does it help at all? The key point in the whole thing is that he's not afraid. He has so many great qualities to be a great manager."